A floodlit Ares I-X departed the Vehicle Assembly Building (VAB) in the early hours of Tuesday, ahead of test launch of a new system that is under real threat of being cancelled in the coming months. However, Ares I-X – set to launch on October 27 from the slightly modified Pad 39B – is still deemed viable, due to its role in gathering important data for the engineering teams. Following the completion of work on a problem relating to the vehicle’s Thrust Vector Control (TVC), final closeouts and vehicle measurements were taken for the early morning roll out of the VAB. “Ares I-X (VAB HB-3) VAB HB-3: Thrust Vector Control (TVC) actuator hydraulic system re-test and closeout testing was successfully completed on Friday,” noted processing information on L2. “The TVC actuator has been re-connected to the compliance ring. The OML geometry results are part of the key elements engineers will be gathering from the flight, along with aerosciences, trajectory, structural modes, flight control architecture, separation sequence, and relevant element differences. Work was also completed on the Thermal Protection System (TPS) foam, which was added around the aft skirt of the four segment First Stage (FS) booster that will carry the dummy Upper Stage and Boilerplate Orion. “FS: AFT skirt foam application was completed Sunday night. AFT skirt foam trimming and MLP (Mobile Launch Platform) clean up continued throughout Monday morning,” added processing information, as engineers then moved on to the removal of platforms that had surrounded Ares I-X in the VAB’s High Bay 3. This included the retracting of the South Platforms, the terminating ECS (Environmental Control System) purge and disconnecting ducts to allow for retraction of E Platform on the north side. Managers kept an eye on the windy conditions at the Kennedy Space Center (KSC) due to a rollout restriction of 25 knots. Weather officer Kathy Winters gave her approval for the rollout to begin, which recorded first motion at 1:39 am local time. Easing out of the VAB on top of the Crawler Transporter system, xenon lights provided a stunning view of what is the first vehicle other than the shuttle to leave the VAB in over 30 years. Ares I-X may be the only vehicle to launch for the Ares program, pending the results of the Augustine Commission’s review into Human Space Flight – which has already stated the “Program Of Record” is unviable, based on its technical and funding challenges that would result in the vehicle only being ready to launch at a time it has no destination to fly to. However, even the Augustine Commission members themselves stated that the launch of Ares I-X should go ahead, as the data gained will be valuable to engineers working on future launch vehicles. The full mission priorities of the Ares I-X launch were outlined in detail during the Ares I-X Launch Readiness Review (LRR) – presentations available on L2 – listing both priority and secondary objectives for the two and a half minute flight. “P1: Demonstrate control of a vehicle dynamically similar to the Ares I/Orion vehicle using Ares I relevant flight control algorithms. P2: Perform an in-flight separation/staging event between an Ares similar First Stage and a representative Upper Stage,” notes one of the presentations. 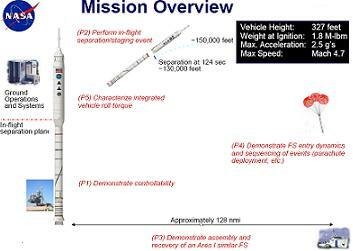 Although Ares I-X is using a standard four segment first stage – as opposed to the five segment booster on the Ares I – engineers believe they will be able to gain some useful Thrust Oscillation data from the flight, which in turn will help validate their computational models. Those secondary priorities – six in total, following the deletion of one task – are also listed in the presentation. “S1: Quantify the effectiveness of the First Stage separation motors. S2: Characterize induced environments and loads on Ares I-X during ascent flight phases. S3: Demonstrate a procedure to determine the vehicle’s prelaunch geodetic orientation vector for initialization of the flight control system (INU alignment).